I covered Google Blogger’s Beta mobile page templates in depth when they were rolled out last January. They work well and look great and go a long way toward making the often unruly Blogger sites usable with a mobile browser. At that time I lamented that the only iPhones and bada and Android devices were detected and served the mobile formatted pages. 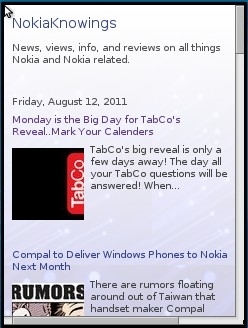 If you visit a Blogger site whose publisher has enabled the mobile templates, such as my www.prepaidphonenews.com or one of my favorite Nokia news sites, www.nokiaknowings.com with Opera Mini 4.3 or latter or the Symbian Anna browser you should now see the mobile version of the site (images). 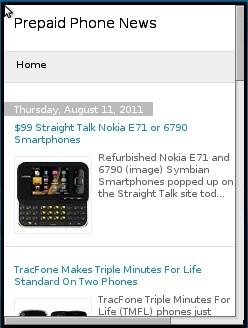 Based on some testing I did using the FireFox User Agent Switcher extension it looks like BlackBerry OS 6 devices (which have a WebKit based browser) and the yet to be released Nokia N9 are also served the mobile pages. Unfortunately, Blogger still doesn’t detect lots of capable mobile browsers including the pre-Anna Symbian^3, WebOS, and Opera Mobile browsers, even though all of them handle Blogger sites perfectly when the ?m=1 hack is used. If you have a Blogger site, do your mobile users a favor and turn on the mobile templates. Heres how to enable mobile template support: Go to Blogger In Draft at draft.blogger.com and log in with your Google account. Click Settings and go to the Email & Mobile tab and select the radio button to turn on mobile templates. Click the Save button when you are done. This entry was posted in Mobile Web Development and tagged Blogger, Browsers, Opera Mini, Symbian Anna by Dennis Bournique. Bookmark the permalink. Thank you! I couldn’t figure out why my Blackberry browser wouldn’t display the mobile version of my blog. Adding the ?m=1 fixed it. Thanks! :D I’ve posted a topic about Blogger mobile templates in the Google webmaster forum before, but haven’t gotten response.